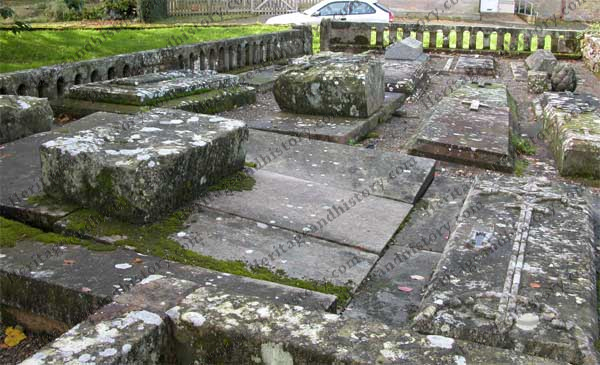 Documents exist which denote a church at Wreay since 1319, in the reign of Edward II, with letters from Bishop Halton writing to give permission for a Chaplain “to attend divine offices” on condition that he reside within the Chapelry. However, a flat-headed corbel arch from the reign of Edward I was found (now above the entrance to the boiler house) so the presence of a chapel or church could date much further. Post reformation saw a dual purpose building, serving as both the chapel and schoolhouse. Following some improvements, this was consecrated by Bishop Fleming in 1739. In 1840 the now delapidated church was rebuilt by Sarah Losh, a local daughter of one of our captains of industry, John Losh. Sarah had the church built as a memorial to her sister Catherine and her parents, according to her own plan in the shape of a Roman Basilica, a rectangular building with an apse. 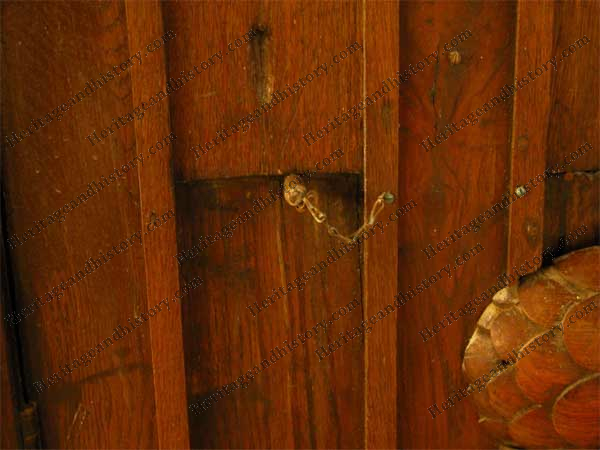 (Multi-purpose and used by the first Christians for worship in the first centuries AD). 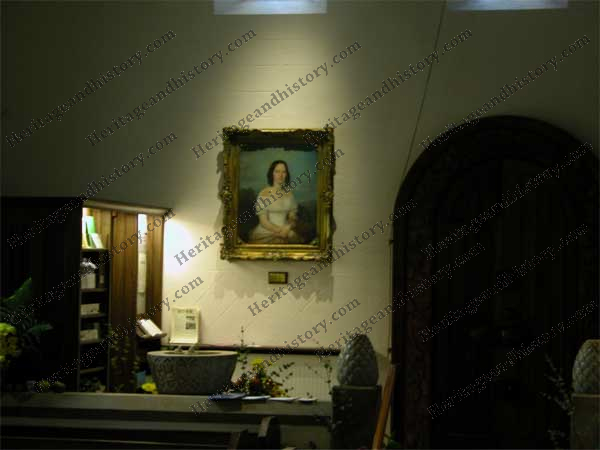 Sarah and her sister Catherine went on a “grand tour” of europe around 1817 and the features of the church are highly reminiscent of Italian and French architecture. Building commenced in 1840 and was completed two years later in 1842. 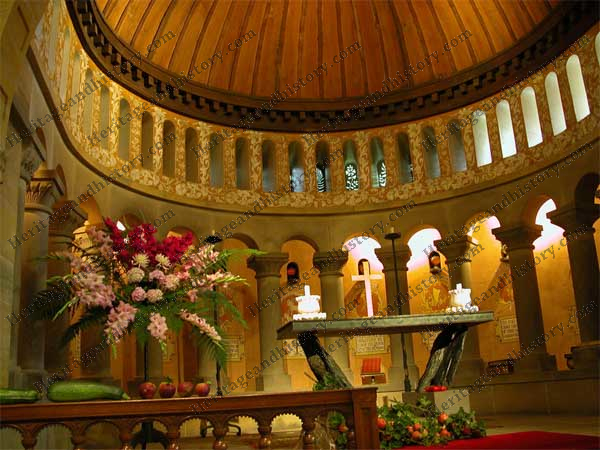 The church is heavily adorned with symbolic ornaments, carvings and oriental motifs. One of the recurring themes is the conflict between life and death, light and darkness. The chrysalis and butterfly, a favourite motif, is the symbol of death and resurrection whilst angles triumph over dragons and bats. 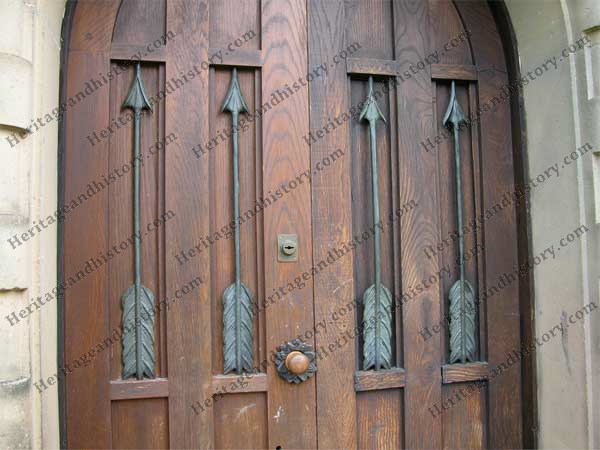 Arrows, symbols of death, feature abundantly at the entrance to the church, both around the well and in the door itself and there is even an arrow lodged in the wall to the right of the organ. A simple but clever piece of carpentry allows the panels behind the arrows on the inside of the door to be dropped down, allowing in light and air. Note the tiny wooden peg which holds the panel closed. One of the other great features carved in stone, wood and alabaster around the church is the pinecone, a symbol of eternal life. It is also thought that the arrows and pinecone may allude to the death of a close family friend, Major William Thain, a local hero who fought at Waterloo and was killed by an arrow in the Afghan war of 1842. Major Thain is said to have sent a pinecone to sarah before he died which she planted in the churchyard. However, the pine tree no longer exists. Sarah succeeded in setting many of the villagers to work on her church. 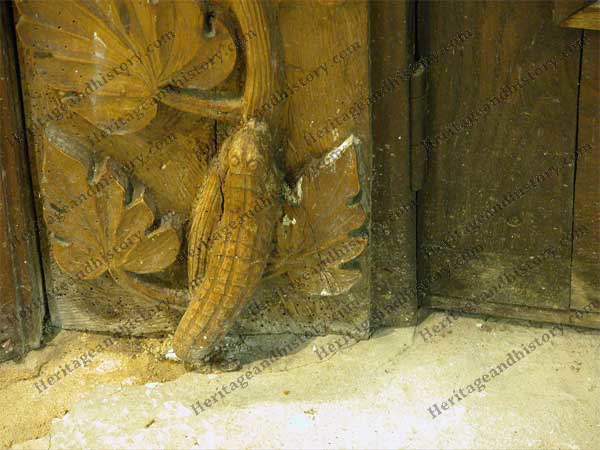 The wood carving around the inside of the west door, which represents a gourd being eaten by a worm (from the book of Jonah in the old testament), was carved by her gardener and she is said to have sent the local stonemason, Mr Hindson, to Italy for a few months to improve his skills there. On entering the church, one is taken aback by the breathtaking interior and the countless hours of work which must have been involved in every detail. 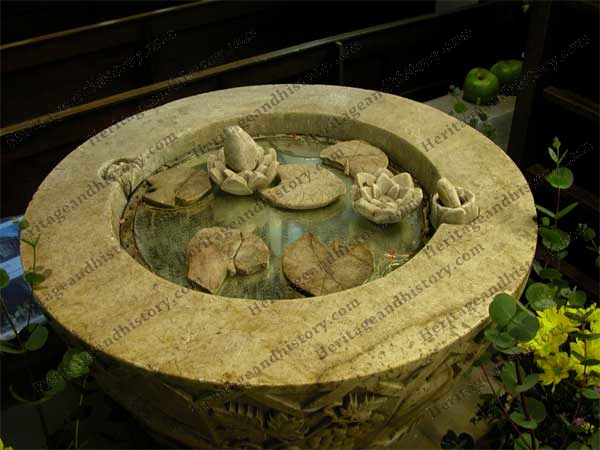 The tiny alabaster font to the right, has ten intricately carved panels, carved by Miss Losh herself, with a cover of silvered glass adorned with alabaster lotus flowers carved by Mr W.S. Losh (Sarah’s uncle). The earlier stone font dated 1738 has been placed outside the church door to the left. 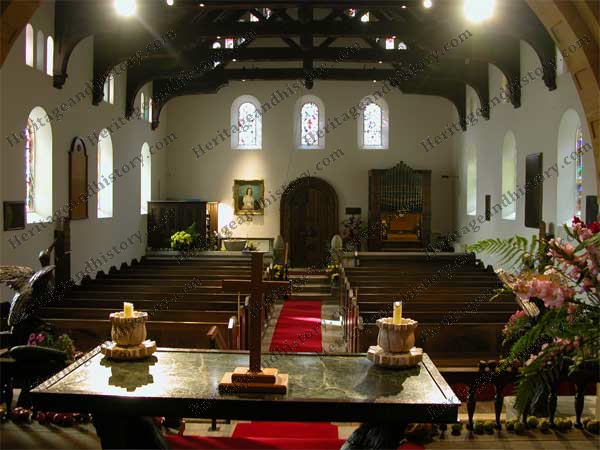 Pews are a framework of oak with panels and seats of Spanish Chestnut. Two lecterns are carved in chestnut, on the north an eagle and on the south a pelican, both on pillars of Bog Oak. 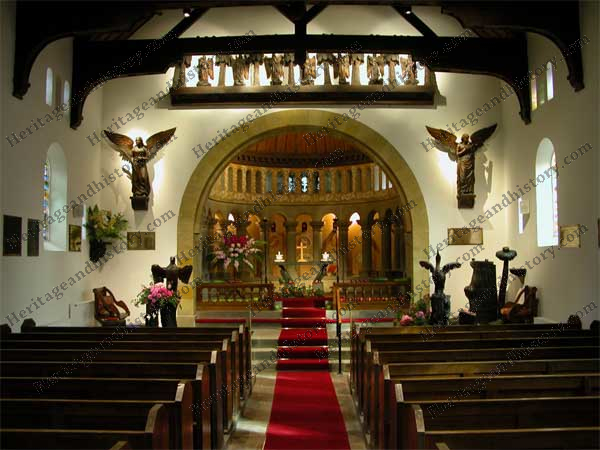 Bog Oak is also used for the intricately carved pulpit, with a palm tree alongside to hold a candle. Above the arch leading to the Apse is adorned with carved angles with the larger beautifully crafted archangels of the annunciation to either side. A slab of green Italian marble forms the altar and is supported by two brass eagles, with carvings of Eucharistic corn and grapes at the base. Unlike most of our churches there is no East Window, but rather an apse with fourteen pillars (sedilia). The spaces between the pillars forming thirteen seats. Above them are the emblems of the twelve apostles with the lamb emblem of Christ in the centre. Seven lamps of the spirit in yellow and orange glass burn behind the sedilia and above these pillars are small “fossil” windows, each painstakingly carved in a different design. The walls around the windows are adorned with decorations of lilies, passion flowers and acanthus. The windows of this small church total 84 in number and are quite a study in themselves. In the Sanctuary are the service books for 1842, with state prayers for King William and Queen Adelaide. To the left of the church stands a Mausoleoum, a memorial to Sarah’s sister Catherine, containing an alabaster figure of her seated and holding a pinecone. This was the work of David Dubar, a Carlisle Sculptor. Behind the mausoleum is a runic cross, erected in memory of Sarah’s parents. 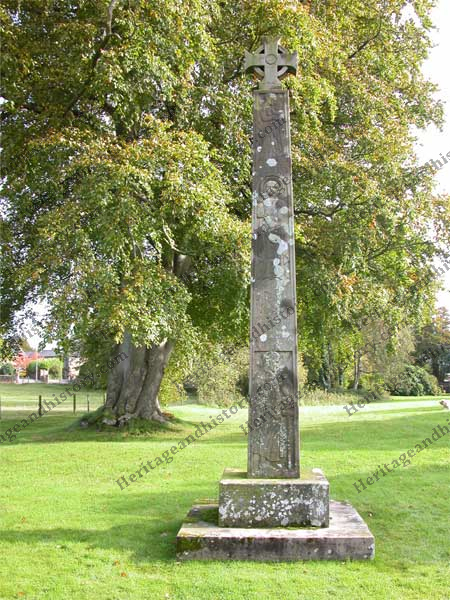 This is said to be a copy of the Bewcastle Cross. Sadly, we are unaware of the name of her gardener and there is very little published information on the Stonemason Mr. Hindson and the Sculptor, David Dunbar, so if anybody is able to fill in these gaps, please let us know via the comments box at the end of this article. Sarah is buried along with her sister Catherine in the Losh family burial plot to the left of the church.